Cyrus Tilton, Lovers. 2011. Steel, muslin, beeswax, and damar resin. 12 x 6 1/2 x 6 ft. Photo courtesy of Vessel Gallery. Cyrus Tilton (1977–2017) grew up in a remote river valley northeast of Anchorage, Alaska, where vast expanses of open wilderness were always close at hand. After moving to the urban environment of Oakland, California, at age twenty-one, he grew concerned with the world’s burgeoning human population, the earth’s inability to sustain such continued growth, and the current trend of mass consumerism. 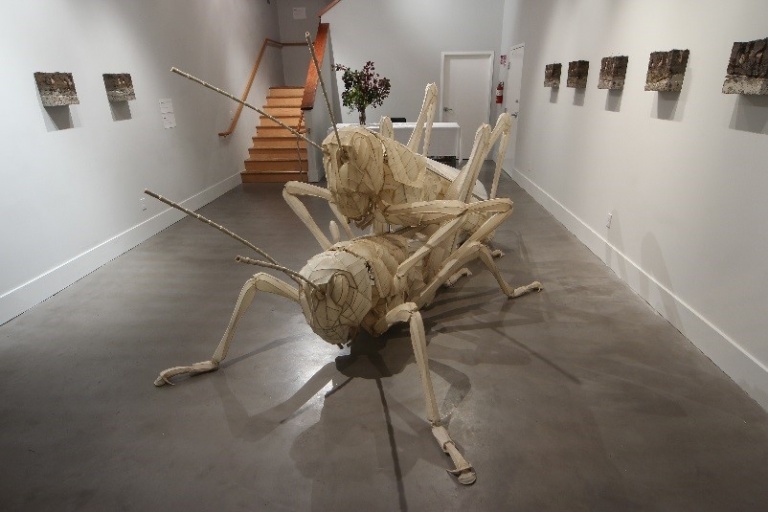 In The Cycle, the locust serves a cautionary metaphor, and Tilton likens the insect to self-sabotaging consumers whose ultimate end will come once their resources are depleted or a massive natural disaster resets the cycle. Tilton received the inaugural John S. Knudsen Prize from the Crocker Art Museum in 2017. The prize supports an emerging or mid-career California artist while also funding programs, exhibitions, acquisitions, and other endeavors related to the artist’s work at the Museum.